Eye On Sports Media: Hey NBC! Forget Jay Leno, How About Law and Order: NCAA Compliance Unit (NCU)? Hey NBC! 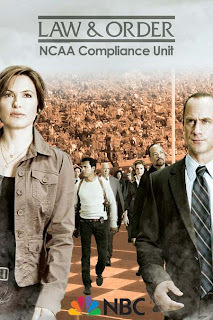 Forget Jay Leno, How About Law and Order: NCAA Compliance Unit (NCU)? There is nothing many people in public relations would like more than to be a fly on the wall at NBC Universal these days. After all, how many times do you get to see a self-made public relations disaster? Well, except for Tiger Woods and Lane Kiffin. Dan Levy, writing for The Sporting Blog, has a solution that is, umm interesting and scary at the same time. But it might lead to a different idea. "Why did Bob Costas do that live interview with Mark McGwire on MLB Network? Costas is NBC Sports, so let him host the show and introduce the different segments, while giving him his own sit-down interview at least once a week. It could be like a combination of Dateline and Real Sports with Bryant Gumbel, but sprinkled with a lot more light-hearted actual sports as well." If middle-America could not warm up to Jay Leno at 10:00 PM ET or Conan O'Brien on The Tonight Show, could they take Bob Costas and his occasional turn to sermonizing? Would sponsors put up with it? It may be that Dan is on the right track, but let's tweek it a little bit. But instead of Bob Costas, they could launch Law and Order: NCAA Compliance Unit (NCU). They could use "ripped from the headline stories" to dramatize all of the allegations at USC. Scandals and beaches in Southern California could drive ratings. Or they could give viewers a torrid story about the Tennessee hostesses and their visits to high school players. They could get Hooters waitresses to play the hostesses since they wear orange too. They may as well give one of our ideas a try. Nothing else seems to be working for the network.